I am often asked to consider basing a wardrobe or a travel capsule on this most lovely of Michelangelo’s works, and I have to admit that I find her sort of intimidating! The unusual color combinations, as well as the overall strength and power of her image are so striking that my brain goes a bit blank after studying her for a while. It’s an eclectic wardrobe, but still has a unifying feel, I think. And you have plenty of ways in which these pieces combine to give you travel (or summer) variety. I might look for a pair of orange earrings? or a solid green scarf? 2011 – I think about the meaning of the phrase Coup de Coeur,and how we should pursue that feeling when we’re shopping. 2013 – My progress with Project 333, back in the days when I was working in an office, are shown in Project 333: Another week, with travel, work and the gym. This is stunning. I have an orange pencil skirt, and I will take see what I can come up with this morning. I'm not seeing that green in the painting at all. Love the combos, though. Oh my. There is no other word but stunning. You are the Michelangelo of clothing blogsters. The moodbook site is great. Grazie. Very interesting combos, but i don't see the green either. And there's a whole lot of beige that didn't show up in the clothing. Coincidence – I was just reading about the Sistine Chapel paintings, amazing background story. Apparently Michelangelo based the female figures on young male models then stuck on the heads and breasts, that's why they're so muscley. Anyway, your combinations are wonderful, I wouldn't know where to begin with such a complex painting. I do love this!! My favorite colors and one of my favorite artists though do take a look at Vuillard's paintings! The green, I believe is in the table cloth behind the figure. Clearly I live a casual, low-brow, rough and tumble life. Instead of focusing on the nuances of the woman and reflecting on how lifting the book is symbolic of the putting away of old prophecies, I kept looking at the little boys. In my viewing of the painting, I can hear the foremost boy whispering, "Knock if off! Mom's going to bust us." Or perhaps I was just overhearing my own sons. Love the outfits. They look like something a mom of rough and tumble boys would wear. As Gail said, "You are the Michelangelo of clothing blogsters." One of my favorite segments of art in The Sistine Chapel!! Ahhh Michaelangelo! You have done a wonderful job here. I love these colors and your interpretation is spot on. This is definitely a color palette I would happily wear. I found this to be so inspiring…you have me thinking of these colors now! Thanks Janice! I notice you often use items from the UK. Do you order from there as well, or is that just to include international readers. I was wondering, if you order from UK companies, have you had trouble with shipping or extra fees, and what are returns like? I occasionally order from the UK or France, after very careful deliberation! Usually I order from companies that cover all of the import fees, which helps a lot. I don't know about returns – I'm quite sure they would be expensive… A lot of the time, I will include images of clothes that feel like the right thing for what I'm working on, and I don't worry a lot about origins – I'm more interested in the quality of the photograph, and the "rightness" of the garment. Absolutely love this. The mix of bright, light and soft colors is spot on, and the outfits feel casual, young and well put together. I'm taking this and pulling from my closet this afternoon! Truly lovely. That would be a cheerful, happy wardrobe to wear! Wow, you are talented! The colours you pick would be lovely on a 'spring' or 'warm summer' from the traditional colour descriptions – a strawberry blonde with green eyes would be ideal. Not my colours, but I do like the clothes. What great colours! I am transitioning with hair colour and was afraid that I would have to give up my orange clothing but I could just soften it a bit with the grey, salmon or soft green. How inspirational! Merci! I have been studying this post quite carefully! I particularly like the mix of colors and the fact that it does not add layers to add interest. I live in the south and can tell you that most of us don't layer from May to October! I will be traveling to South American this summer and plan on using this as a guide for what to pack. I will be "shopping my closet" for most things. 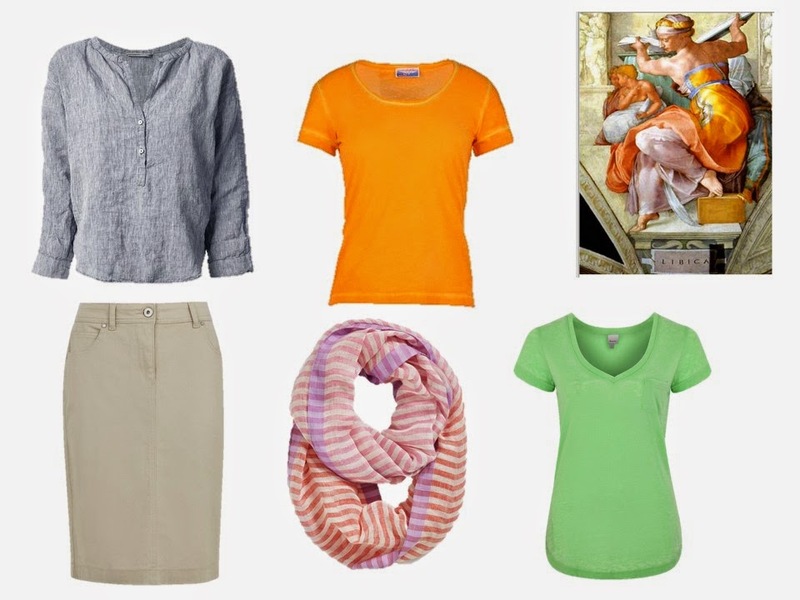 I already have the grey shorts, grey pants, green, orange and grey striped t-shirts. I will be picking out a few new things – adding some black and more technical fabrics (wicking, anti-microbial, sun protection, etc). It is amazing what fabrics are out there now to make travel easy and look less like Indian Jones! Thanks so much for the inspiration! Way nicer than the "Ma Wardrobe". Trust yourself.